I have to apologize to Steven Moffat. Mind you, he probably doesn’t know he needs to be apologized to. Or, rather, as a writer for the new Doctor Who series on BBC, there are probably lots of people he thinks should apologize to him (such as fans who aren’t happy with the direction he’s taken the character and who aren’t shy about saying so, or providing hate mail), but he doesn’t know that I’m one of them. Not like I went out and sent an angry e-mail or wrote a scathing blog about it or posted a YouTube video rant. What were the flaws? Well, primarily I was annoyed with writer Moffat for having gone with the Princess Bride gambit for the big reveal on how the murderer got his victims to commit suicide. This comes when our hero, Westley, as the Man in Black, has been forced into a combat of wits with the Sicilian, who has placed two glass of wine on a table in front of himself and Westley. One of the glasses contains deadly iocane powder; the other does not. Westley must choose one to drink while the Sicilian will drink the other. So, when the climactic moment comes in Sherlock’s A Study in Pink and it’s essentially the murderer putting two pills on the table in front of himself and Sherlock Holmes, one poison and the other not, I groaned and said, “That’s cheesy; they went with the Princess Bride gambit. I expected more from the man who brought us BBC’s Jekyll and the excellent Doctor Who episodes “Blink”, “Silence in the Library,” “The Beast Below” and many others. I should mention here that I have read Sir Arthur Conan Doyle’s novel A Study in Scarlet, which is the first story to feature his most famous literary creation, Sherlock Holmes. 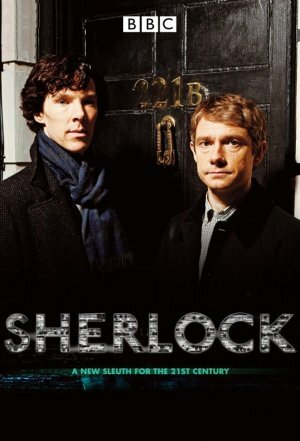 It’s the story where Watson meets Holmes and moves into 221b Baker Street with the detective. It’s the story where Watson and Holmes first collaborate on an investigation. Apparently, despite reading it, possibly twice, I didn’t remember how the murder victim was killed, which was … drumroll puhlease … by the murderer offering his victim one of two pills, one of which was poison and the other of which was not. That’s right, Steven Moffat didn’t borrow from The Princess Bride to give umph to his modernization of the Sherlock Holmes stories; rather, The Princess Bride borrowed from Sir Arthur Conan Doyle to create their famous iocane powder scene. I would still complain that Moffat made his scene a little too much like the staging in Princess Bride, but then again it’s quite possible that he did it on purpose, to make the letter-writers and the bloggers and the YouTubers make themselves look silly by complaining about it. Like I was going to. So, wait a minute, that’s a really tricksey way of going about things. I’m not going to apologize for almost being tricked into making myself look silly. Nope, I’m going to write a nasty letter to Steven Moffat demanding that he apologize to me. Or maybe I’ll just go watch another episode of Sherlock. This entry was posted in Reviews and Rants and tagged Princess Bride, Sherlock Holmes, Steven Moffat. Bookmark the permalink.